Barnsdall Art Park's Municipal Art Gallery hosts perhaps the timeliest of art exhibits, SKIN, on view thru April 17, 2016. 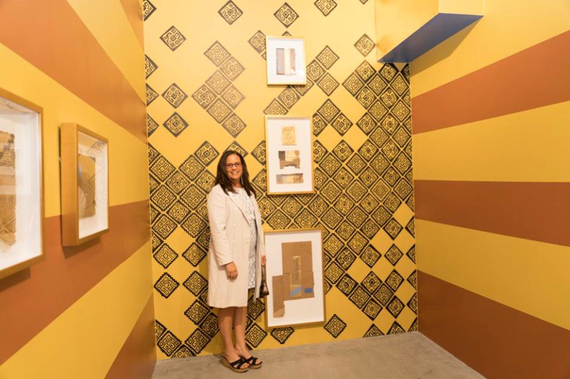 Under the curatorial direction of Barnsdall's director Isabelle Lutterodt, SKIN presents a myriad of stylistic and formal approaches to art by over thirty artists, all related in some manner to race. Post-Ferguson, the issue is charged and on the front burner, but progressive politics do not necessarily translate to dynamic art. The era where lily-white art school faculties encouraged artists to ignore race and politics is over; post-colonial theory has replaced post-structuralism in the ivory tower. Boring obtuse art posing as semiotics is out at the MFA diploma mill but that means a lot of preach-n-spoonfeed art is in. Amidst this background, though, there are bright spots of the art world dragging the institutions kicking and screaming toward diversity, inclusion and an elevated consciousness that also crafts memorable visual and conceptual experiences. While commercial galleries shrink from playing the "bite the hand that feeds you" game that all art addressing power must enter into, larger institutions can only be counted on to embrace political shows as long as the pursuit of radical chic doesn't jar the donor base. Small and medium art institutions therefore remain vital to mount shows that take on the big issues of our time. The Los Angeles Municipal Art Gallery at Barnsdall Art Park is the perfect place for the type of socially-conscious curating that is as inclusive as it is demanding of high artistic quality from those that would be partisan. 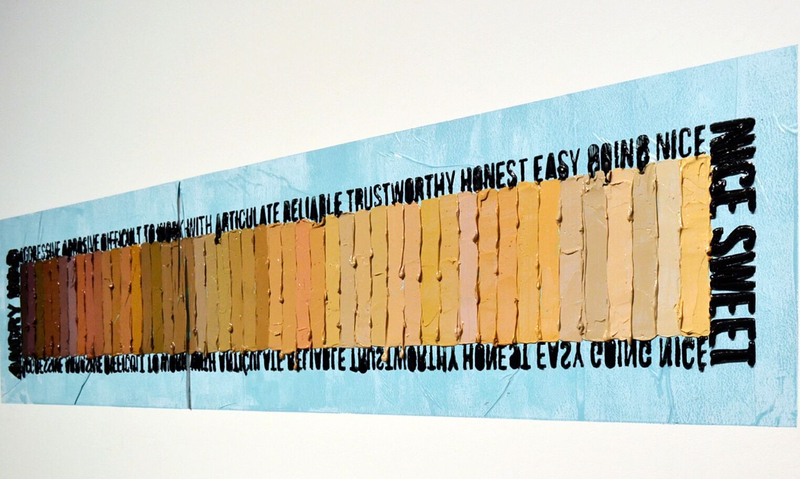 Lutterodt had an open call for art under the theme of SKIN as metaphor for race and has included household names like Kara Walker, Los Angeles art scene veterans like Sandy Rodriguez and Nery Gabriel Lemus, as well as a smattering of artists for whom Barnsdall will be the biggest show of their career to date. While the exhibit has its highs and lows, it is a must-see spectacle for anyone whose political consciousness comes close to matching their good taste in art. Here are six exemplary artworks in the show that pack the perfect punch of invigorating concept, sublime aesthetic and masterful execution. A billboard-sized collection of monochrome sculptural portraits in museum collections are arranged as a black to white gradient, revealing the skin tones of various races depicted in a range of color, black to dark greens, oranges to ambers to bleach white. Hung on a far wall, the piece looms over the whole exhibit to put the objects here in a true historical context. Artists may be trapped in the biases of their century but art can speak the truths of the past with an allure to seduce the future. Another artwork that uses the color gradient but this one more politically pointed. Shades of skin color are applied as expressionist impasto, dark to light. Framing the colors are words that various emails used to describe her during graduate school. The ultimate institutional critique is anything that pops open the hermetically sealed bag of white liberal racism to show it as the same kind of ugly the conservatives brandish. This one probably made more than one gallery-goer scour their old spam folders. 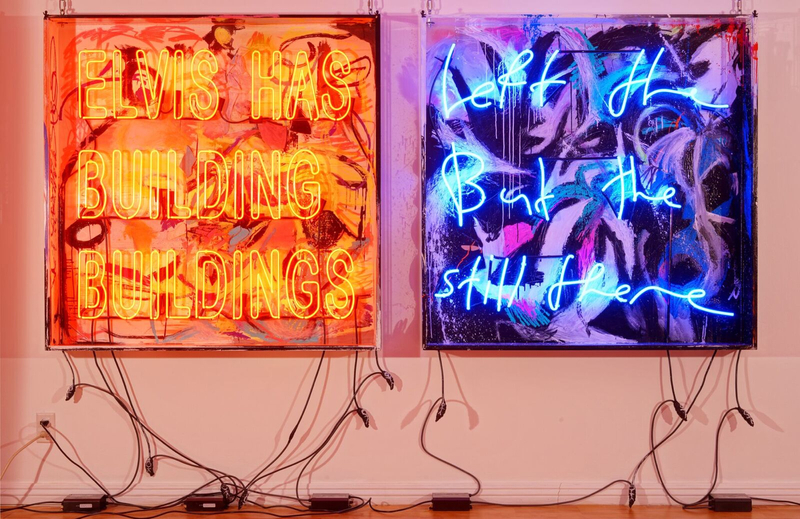 A brash neon sign carries the subtlest message, and one's interpretation reveals much about the viewer. "Elvis has left the building but the buildings (sic) still there" it reads - in neon that is sharply divided left to right, with different colors and fonts. In a show about rock and roll this artwork might mean something completely different. In a show about race it can be construed that Elvis was a bridge between two cultures by one viewer while the next will see him as the ultimate polarizing figure. The usually pathetic trope of "leaving meaning up to the viewer" here becomes a poetic detente zone - where a powerful artwork can reflect where each of us stands in an endless emotional conversation. Props go to the curating at the Los Angeles Municipal Art Gallery for mounting this installation that delivers the reality of Barnsdall Art Park - Mayan revival patterns from the nearby Frank Lloyd Wright Hollyhock house sit depressingly near to tents and cardboard boxes on the property sheltering the homeless. 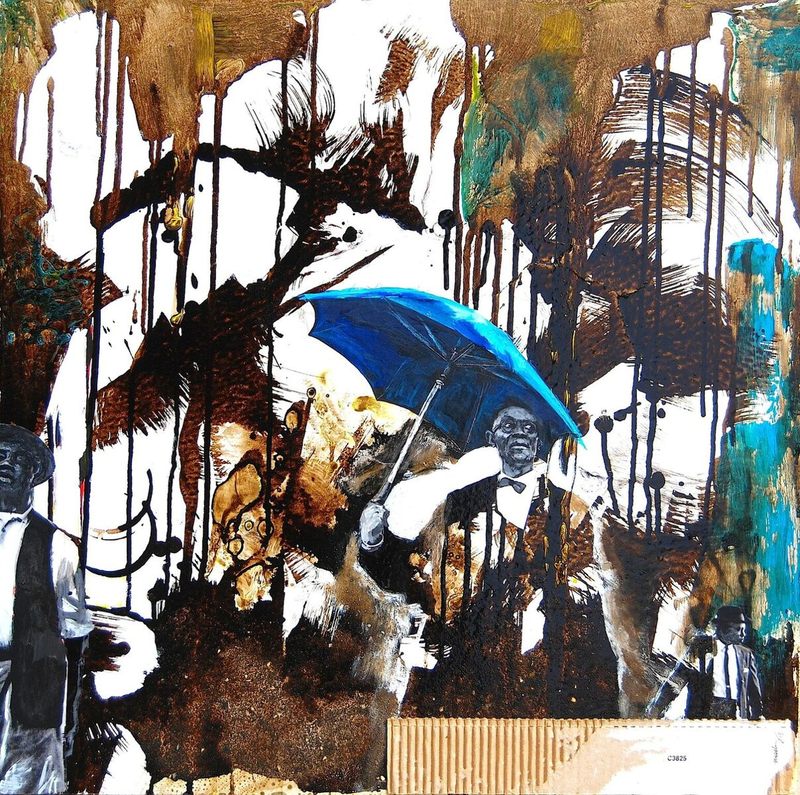 The artist delivers a poignant sermon on race and class divides without ever preaching. The beauty of the installation is seductive but the small anteroom in which it is installed is slowly claustrophobic, like so much dialogue based in race and class. Michael Massenburg is perhaps L.A.'s best unsung expressionist figurative painter. After all the digressions subverting painting and enacting new forms as fine art, a simple square canvas on which a painter enacts the sheer joy of composition can be a triumph. Here he paints African American men as part of a joyful composition, mysterious yet accessible, part of the landscape yet aloof from it. A brilliant small picture that accomplishes so much by setting out to simply be a great painting. It isn't any coincidence that the two bullet holes in this photorealistic rendition of engraved signage each landed in a letter "O". The two presidential terms of Barack Obama have been marked by gun violence and overt racism. And yet this eternal phrase seems to show that its wisdom endures despite the aim of hatred. Those are my picks for six outstanding works in an outstanding, all-too-necessary exhibition. Check out SKIN and see which of the almost fifty artworks on display are your favorites. If you want any more incentive to follow these interesting artists, here below is an episode of my live web-streamed art talk show MODERN ART BLITZ featuring Michael Massenburg and April Bey. The Los Angeles Municipal Art Gallery is located at Barnsdall Art Park at 4800 Hollywood Boulevard in Los Angeles, California. The gallery is open Thursday thru Sunday, Noon - 5 PM. Admission is free. For more information visit LAMAG.ORG on the web.